Poll: Did 'storm fatigue' affect people's preparedness for Storm Ali? Tánaiste Simon Coveney suggested this may have been the case. 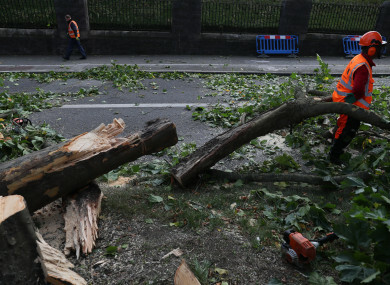 A fallen tree on Finglas Road near Glasnevin Cemetery. STORM ALI CAUSED widespread disruption and two deaths as it passed over Ireland yesterday. In advance of yesterday’s storm, Met Éireann had predicted mean speeds between 65-80 km/h and gusts between 110-120 km/hr. Over the course of the day, most gusts fell into that range but two surpassed it. The predicted winds meant that the storm met the criteria for a Status Orange warning under Met Éireann’s colour-coded warning system. An orange warning means people should “be prepared” for the conditions. Facing questions about whether the government was prepared for the storm, Tánaiste Simon Coveney said suggested that people may be suffering from “storm fatigue” and “don’t really sit up and notice” unless there’s a Status Red warning. Today’s poll: Did ‘storm fatigue’ affect people’s preparedness for Storm Ali? Email “Poll: Did 'storm fatigue' affect people's preparedness for Storm Ali?”. Feedback on “Poll: Did 'storm fatigue' affect people's preparedness for Storm Ali?”.